Visit hashtagcommoncore.com to view the research and join the conversation! In the past year, arguments about the Common Core State Standards have spilled from education policy circles into the public discourse. By democratizing the flow of information and offering a rallying point for normally divergent groups, Twitter has played a key role in the crossover. New research reveals the heated debate is actually a proxy war for broader disagreements about education policy and the very direction of the country. The fight over the Standards — according to researchers Jonathan Supovitz (University of Pennsylvania Graduate School of Education), Alan J. Daly (University of California, San Diego), and Miguel del Fresno (Universidad Nacional de Educación a Distancia in Madrid, Spain) — is redefining how education policy is shaped, understood, and implemented. 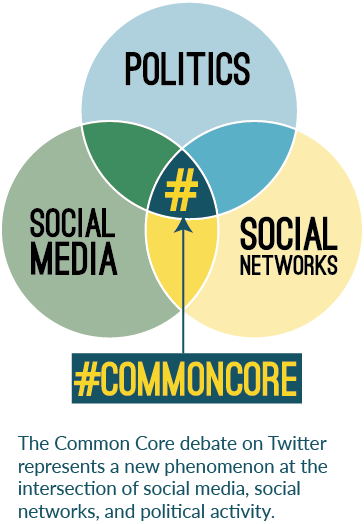 For their study, #commoncore: How Social Media is Changing the Politics of Education, the researchers deeply examined how the Common Core debate played out on Twitter, a medium that intersects social media and mass media. They tracked and analyzed around 190,00 tweets containing #commoncore, authored by about 53,000 distinct actors during a six-month timespan from September 2013 to February 2014. During that time, the debate moved into the mainstream. It became a campaign issue for politicians from both parties, as fights for re-writes and repeals gained traction. The #commoncore project lets viewers see how actors form informal networks on Twitter, and how those networks create and amplify narratives. By dissecting these networks, the researchers tell the story of how ordinary citizens and social media advocacy groups can gain greater influence than so-called authority figures who would have dominated this conversation even a decade ago. Some of the key people in this fight, they learn, don’t necessarily make the most provocative statements, but retweet information, both factual and not, to a large and diverse collection of followers. By graphing these networks, the researchers let you see how this policy debate plays out in fascinating detail. In podcasts, some of the most influential members explain their views on the Common Core and what Twitter has done for them. The most common arguments against the standards were not based on the standards themselves, but broader political issues, such as a perceived federal role in education; a post-Snowden belief that the standards are a gateway for accessing data on children; concern over a perceived proliferation of testing that has become oppressive; and fear of business interests exploiting public education for private gain. Supporters and opponents argue differently. Common Core supporters fill their tweets with policy points. Common Core opponents use political language that often groups the standards with a broader spectrum of positions they disagree with. The Common Core is often explained in metaphors. Often, the metaphors don’t accurately describe what the writer intended. As these metaphors are repeated and retweeted, the can become the dominant narrative, not the original intended message about the standards. This is one-way misinformation spreads. The number of actors using #commoncore continues to grow. The networks uncovered during the initial project continue to evolve. Where there were three distinct factions in the original monitoring period, mergers of networks make it appear there are now two factions. Organizational and institutional actors seem to be playing an increasingly large role in the debate.